Many safe accessories are available to help make the most of your safe or vault. They can generally be classified into the following categories: Humidity and temperature control; lighting; space saving products; additional security; and that all-important “miscellaneous things.” Gun safe accessories make great Christmas and Birthday gifts for that special hunter or shooter. Dehumidifying Rods are basically heat bars that you lay in the bottom of the safe with an electrical cord running out the back of the safe. They heat up to about 120 degrees, raising the temp and lowering the humidity. Air warmed by the bar rises, causing slight air movement inside the safe. We sell the Dri Rod brand in 12” and 18” sizes. We advise against using heat bars in safes which hold photos, stamps, historic papers, leather items, etc., because the extra heat may artificially age these things. Peet Brand Safe Dryers have become favorites of ours because they take up less space in the bottom of the safe. 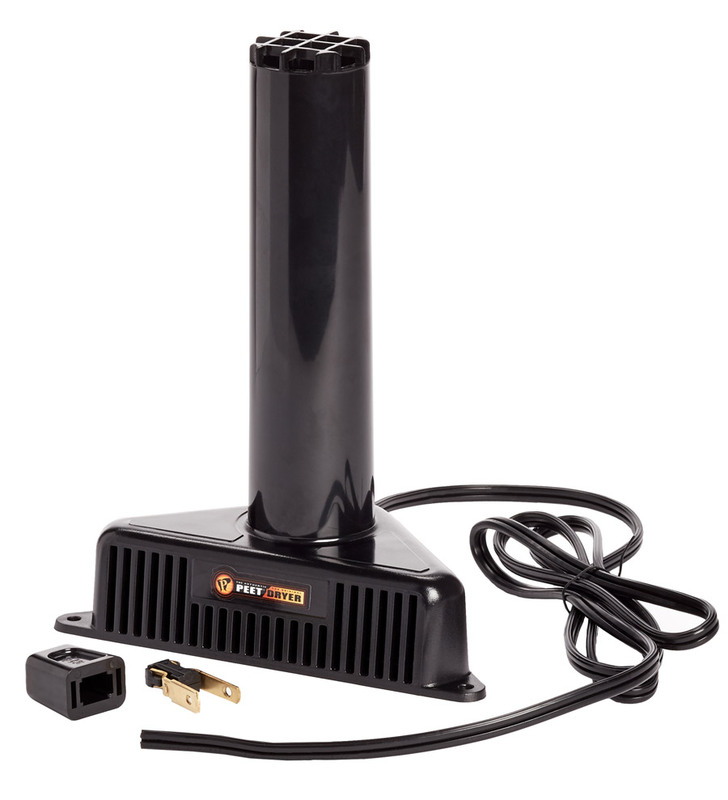 Many folks have Peet brand boot dryers for shoes and hunting boots. The “stack effect” seems to create more air movement in the safe than heat bars. Note that the first time you plug them in they give off a burning smell, so “break them in” outside the safe or with the door open. Same warning as above about things that may age with heat. Desiccant is Hygroscopic – it actually absorbs moisture from air without changing the temperature. Desiccant packets are what they put with electronics, medicines, etc., to keep moisture from affecting products during shipping and storage. It comes in one-pound bags, boxes and cans for use in gun safes. Desiccant needs to be dried out after it gets saturated. This normally takes many hours in an oven at about 200 degrees – not very convenient! 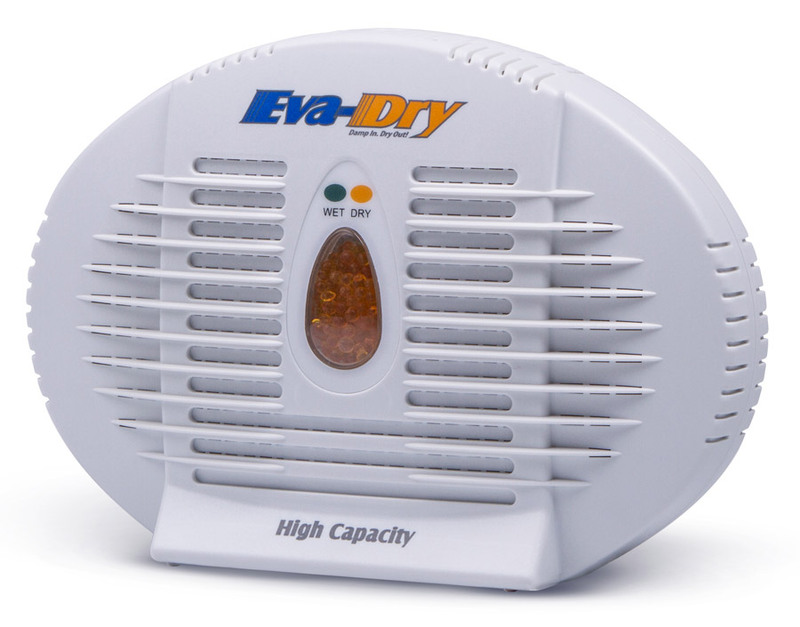 Eva Dry brand desiccant products are what we sell more than anything else for humidity control. They are plastic containers (two sizes) full of the same kind of beads you see in the bags and pouches, with a color indicator that tells you when the unit needs to be dried out. There is a built-in electrical plug that you stick into an electrical outlet, and in about 10 to 12 hours a small internal heater dries the unit out. It is then ready to work again for three to five months, depending on how often the safe is opened. They are guaranteed for five years. Temperature and Humidity Monitoring Devices for inside safes are made by several companies. We sell a few hygrometers, but the remote monitors don’t seem to work well. 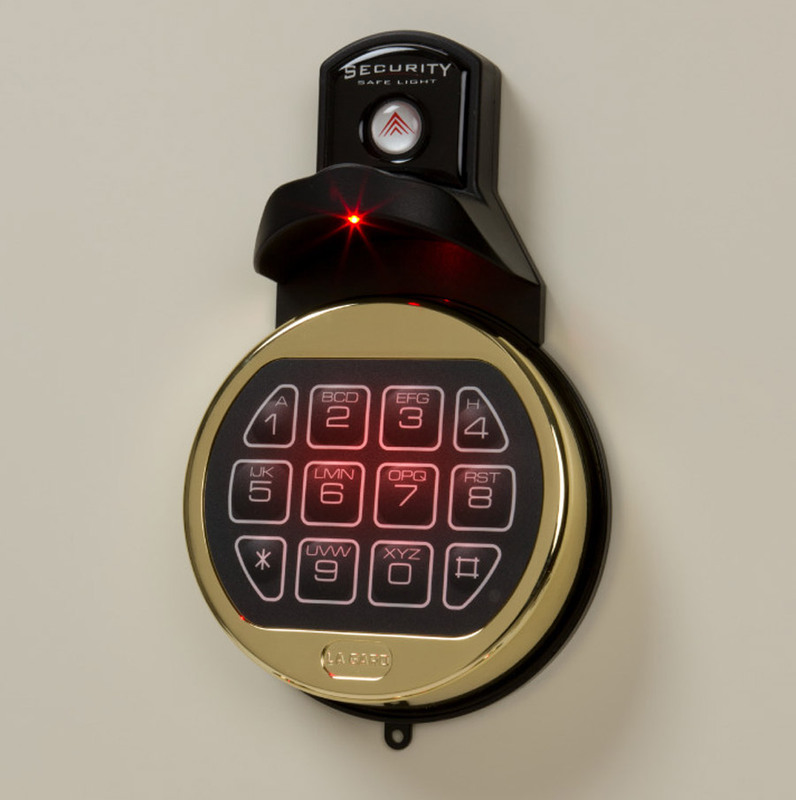 Over-Dial Lights are small magnetic, battery operated lights that you put directly over the safe dial or keypad so you can unlock your safe in poor light. Push a button and a red light comes on for a couple minutes. There are different models for combination or electronic locks. Portable Switch Lights can help you find what you are looking for cheaply, at less than $10. In addition to mounting magnetically, the ones we sell have patches of hook & loop fabric so they can be mounted directly to the Velcro fabric that lines Fort Knox vaults. They have about a million other uses, anywhere you need extra light — like inside a deer blind when you get there an hour before daylight. LED Light Systems for inside gun safes are terrific accessories that make finding things easy. They light up the entire interior. We sell basic units for $115 and premium setups for $150. They are usually hard-wired and are either motion activated or door activated so you don’t need to remember to turn them off. The premium systems are multiple ridged strips that you can re-position as needed. Hook & look patches let you mount them to Velcro compatible fabric, like inside Fort Knox vaults. The best systems have plastic coverings that diffuse light rather than just point it forward. Pistol Pockets are extremely popular for hanging handguns on Velcro compatible surfaces in gun safes. Instead of laying pistols down on shelves, save that space by mounting pistols on the door panel or safe walls. They work on the long fiber fabrics inside many low-end gun safes, and on the Velcro compatible fabric in Fort Knox vaults. Door Organizer Systems allow you to hang handguns on the inside door panels of gun safes. Make use of those few inches of space between the door panel and the front edge of shelves. These organizers also accommodate extra magazines/clips, knives, tools and papers. Many new safes come with door organizers installed, but after-market organizers are available too. Door Mounted Pistol Racks are available from Fort Knox and others. Handguns are held by vinyl covered hooks that are attached to a mounting bar. We don’t sell many of these but some guys just love them. 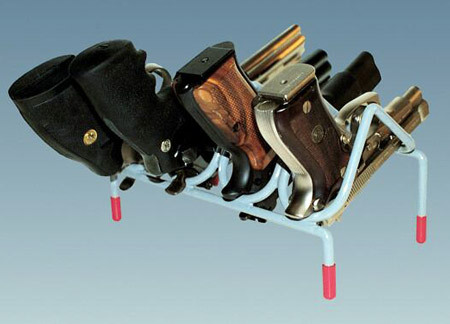 Hand Gun Racks from Versatile Rack Company are vinyl coated steel holders that store guns vertically to save shelf space. Made to hold 2, 3, 4, 5, 6, 8 or 10 guns. They also make nice displays to show off favorite weapons in your man cave. Gun Storage Solutions Company offers many creative ways to use safe space efficiently. Some of their vinyl coated steel holders stand on top of a shelf, but most grab onto the edges of the shelves. The gun barrel is slipped over a vinyl coated steel rod so your pistols can hang in a vertical position above or below the shelf. Great space savers! 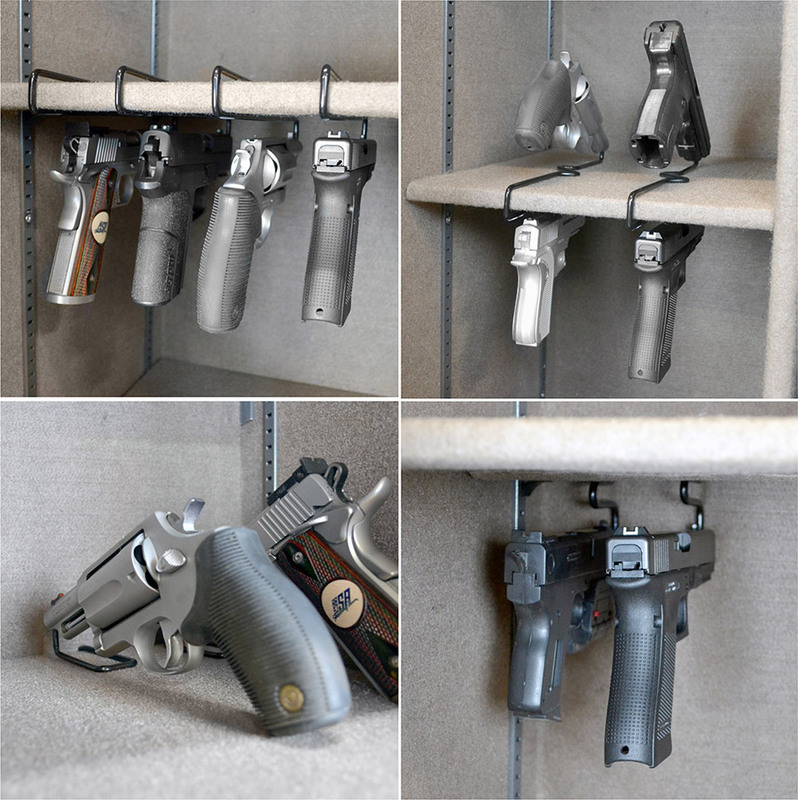 Gun Storage Solutions makes versions for use with peg-board or slat wall systems too. You have probably seen their products displaying pistols at your favorite gun store. Storage Bags and Zippered Tool Pouches with hook & loop fabric are available from Fort Knox and other companies so you can store things on Velcro surfaces inside your safe. There is even a water resistant pouch for holding cleaning fluids or oils that might spill if put onto a shelf. Gun Sox are long tubes of heavy, stretchy fabric with draw-string tops. Slip a long gun inside the sock and even when guns bump into each other they will not get scratched or dented, so you can really cram lots of guns in your safe. They are also said to prevent rust and give extra protection in case of fire. In many states slipping your rifle into a gun sock will keep you legal when in the woods before and after shooting hours. A “safe within a safe” always intrigues our customers, whether it is a light duty unit or a heavy duty money chest weighing 200#. If you share a large safe with your spouse or other family members, it is cool to have a small part of it reserved only for you. Maintain your privacy with a tiny little safe where you can hide your fun money or the jewelry you bought for your spouse’s Christmas gift. The extra weight from placing a heavy money chest in the bottom of a bigger safe makes it that much more difficult for someone to move your safe. And even if your large safe is forcibly opened it is extremely unlikely that the money chest could be compromised. If you keep large volume of cash, silver or gold at home, this is the place to keep it. Alarm Systems for safes come in several types. Some just make noise to scare off a burglar, some can notify you by cell phone that your safe has been opened, others can notify a security monitoring company. Door contact alarms are the most common. Extra steel is not really an accessory but it deserves mention. 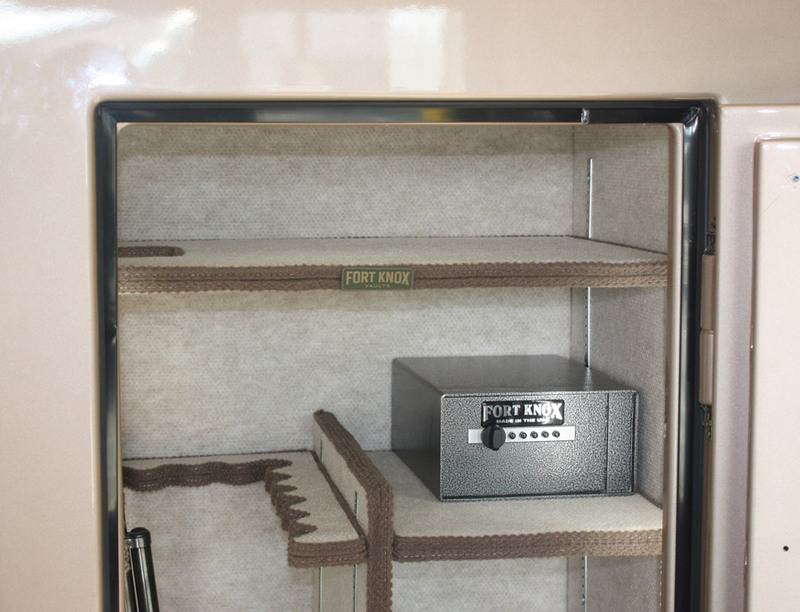 Fort Knox allows you to order your gun safe with extra steel in the body and/or door of your gun safe. You can also add an inner steel lining, or layers of stainless steel or Armaknox ballistic rated steel. If you need to protect stuff of high value, more steel equals more security! Hockey Pucks. For those folks who do not want their gun safe sitting right on the floor, hockey pucks under the four corners is an inexpensive way to move the safe about one inch off the floor. This is a good idea if you sometimes experience minor flooding. Carpeted Pedestals by Fort Knox gets your safe about four inches off the floor in an attractive way. Built with 2×4’s and plywood, enclosed on all four sides, covered with silver or beige carpet, in five sizes. You can make your own but for around $75 Fort Knox’s are a bargain. Magnets are seldom thought of as safe accessories in spite of the fact that they can be very useful. There are rare earth magnets strong enough to hold pistols securely to steel surfaces. Standard type magnets can hold steel magazines in convenient places. For those duck and goose hunters that love to show off their calls and bands, a magnet with a hook on it allows you to hang all your calls on the outside of the gun safe. Save space inside while showing off your collection. Those bulky elk bugles and lots of other things could he hung on the outside of the safe too.